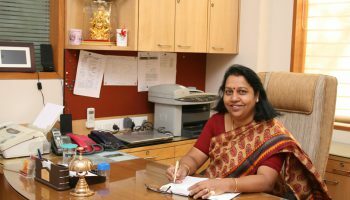 Dr. Usha Mukundan had a brilliant career- Distinction in B.Sc., First Class in M.Sc. followed by a Doctorate in Plant Physiology. She did post-Doctoral research in Plant Biotechnology, Hairy Root Cultures, at Louisiana State ‘Varsity, U.S.A. in 1997, the area of her research being Downstream Processing. The awards and prizes that she has won for academic excellence are many. To mention a few: College Merit Scholarship, Rameshwar Saboo Gold Medal for standing First among B.Sc. students of the R. J. College, the Nirmala Welingkar Prize for standing First among the B.Sc (Botany) students of the ‘Varsity of Mumbai, National Merit Scholarship and UGC Career Award in Science. Recently in 2011 she was awarded the BEST TEACHER Award 2010 by Government of Maharashtra. She followed her natural bent to be a teacher and joined the R. J. College, where it did not take very long for her to ascend the different rungs of the ladder and reach the pinnacle, i.e. the Principalship of the College, in July, 2004. With her passion for excellence, she has done much to develop the Faculty of the College by organizing Faculty Improvement Programmmes. She has been a Member of Board of studies in Botany of the Mumbai ‘Varsity from 2002, member of the Faculty of science from March, 2004, NAAC Peer Team Member, Convener of Board of studies in Biotechnology of the Mumbai ‘Varsity from 2008 and UGC XIth Plan Western Region Commitee member from 2009. She has supervised research for M.Sc., M.Phil.and Ph.D Courses. 30 of her students have already completed ph.D. 7 are registered at present. The research publications to her credit are numerous. Many are the Overseas Assignments that she had. To name a few: International Conference at Kew Botanical Gardens, London, 1994, International Conference of IAPTC, Florence, Italy, International Conference of IAPTC, Israel, 1998, International Conference, Singapore 2000, INSA-KOSEF Scientific Exchange Programme, South Korea, 2003. She is a Life Member of several Professional Bodies such as International Association for Plant Tissue Culture Biotechnology, U.S.A., Indian Botanical Society, Indian science Congress, The Orchid Society of India, Indian Society for Cotton Improvement, International Society of Plant Morphologists, Indian society for Plant Biochemistry and Biotechnology and the Society for Biology and Biotechnology. She is an Executive Member of the Indian Botanical Society (2004-2007). 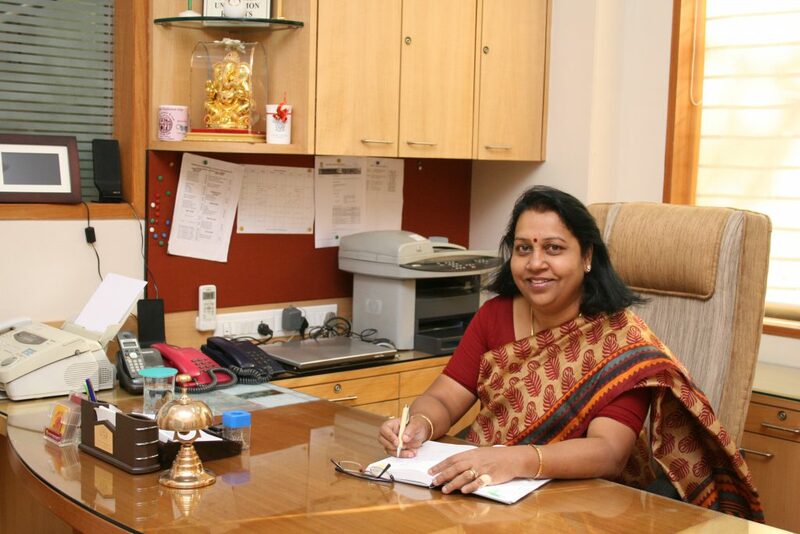 In short, Dr. Usha Mukundan stands out as a person with academic and professional achievements. RJ College Degree (Postgraduate) Reader M. Sc. Title: Hairy root cultures and plant cell suspensions as biotransformation systems. Funding agency: Bharat Serum and Vaccines Ltd. Title: Transformation and regeneration of forest trees. Title: Somatic embryogenesis and studies on genetic variability in Emblica officinalis Gaertn. Funding agency: Hindustan Unilever Ltd.
Mukundan U and Hjortso M A (1990). Effect of fungal elicitors on thiophene production in hairy root cultures of Tagetes patula. Applied Microbiology Biotechnology. 33, 145-147. Mukundan U and Hjortso M A (1990). Thiophene accumulation by hairy root cultures of Tagetes patula in response for fungal elicitors. Biotechnology Letters 12 (8), 609-614. Mukundan U and Hjortso M A (1990). Thiophene content in normal and transformed root cultures of Tagetes erecta: A comparison with thiophene content in roots of intact plants. Journal of Experimental Botany. 41 (232), 1497-1501. Mukundan U and Hjortso M A (1991). Growth and thiophene accumulation by hairy root cultures of Tagetes patula in media of varying initial pH. Plant Cell Reports. 9 : 627-630. Mukundan U and Hjortso M A (1991). Effect of light on growth and thiophene accumulation in hairy root cultures of Tagetes patula. Journal of Plant Physiology. 138: 252-255. Mukundan U (1994). “Biotechnological studies in Mangroves”. “In conservation of Mangrove genetic resources”, A training manual. International tropical timber organization, Yokohama, Japan, eds. Sanjay V Deshmukh and V Balaji. M S Swaminathan Foundation, India. Hjortso M A and Mukundan U (1994). Genetic transformation in Tagetes sps (Marigolds) for thiophene content. Biotechnology in Agriculture and Foresty, 29, Plant Protoplasts and Genetic engineering ed. Y P S Bajaj, Springer Verlag, Berlin. Mukundan U and Ratnaparkhi S (1996). Studies on hairy root cultures of some compositae. In D J N Hind (Editor in chief). Proceedings of the International Compositae Conference, Kew, 1994, Vol. 2, Biology and Utilization. Ed: P Caligari & D J N Hind. pp. 393-400, Royal Botanic Garden, Kew. Joshi C D and Mukundan U (1997). Algal disfigurement and degradation of architectural paints, PaintIndia, XLVII (1), January. Joshi C D, Mukundan U and Bagool R G (1997). Fungal fouling of architectural paints in India. Paintindia, XLVII (2), February. Joshi C D and Mukundan U (1997). Microbial succession on architectural paints in India. Paintindia, XLVII (3), March. Mukundan U (1997). Hairy root cultures: An experimental system for secondary metabolite production. In Role of Biotechnology in medicinal and Aromatic plants, Vol. I. Eds. IA Khan and A Khanum. pp.149-165. Ukaaz Publications, India. Dawda H G, Rai A and Mukundan U (1997). Establishment and studies of hairy root cultures. In : Biotechnological Applications of Plant tissue and cell culture. Eds G A Ravishankar and L V Venkatraman. pp 240-244. Oxford and IBH Publishing Company, India. Mukundan U, Rai A, Dawda H G, Ratnaparkhi S and Bhide V (1998). Secondary metabolites in Agrobacterium mediated transformed root cultures. In: Plant tissue cultures and Molecular Biology: Applications and Prospectus. Ed. PS Srivastava. Narosa Publishing House, India. Mukundan U, Carvalho E B and Curtis W R (1998). Growth and pigment production by hairy root cultures of Beta vulgaris L. in a bubble column reactor. Biotechnology Letters, 20(5), 469-474. Mukundan U, Bhide V, Singh G and Curtis W R (1998). pH mediated release of betalains from transformed root cultures of Beta vulgaris L. Applied Microbiology and Biotechnology, 50 (2), 241-245. Mukundan U (1999). Production of vaccines by transgenic plants. In: Role of Biotechnology in medicinal and Aromatic plants. Vol. II. Eds. IA Khan and A Khanum. pp 103-108. Ukaaz Publications, India. Chatterjee P, Golwalkar S and Mukundan U (2000). Production of peroxidases by hairy root cultures of Cucumis melo L. Peroxidase Newsletter, 13, 19-24. Mukundan U, Asplund P T and Curtis W R (2000). Cytochemical assay to localize respiratory activity in hairy root cultures. Phytomorphology, 50 (2), 184-187. Mukundan U and Hjortso M (2001). Transgenic Tagetes spp. (Marigold). In: Biotechnology in Agriculture and Forestry, 48. Transgenic crops III ed. Y P S Bajaj Biotechnology in Agriculture and Forestry, 29, Plant Protoplasts and Genetic engineering Ed. YPS Bajaj. Springer Verlag, Berlin Heidelberg. Mukundan U, Bhagwat V, Singh G and Curtis W R (2001). Integrated recovery of pigments released from red beet hairy roots exposed to acidic medium. Journal of Plant Biochemistry and Biotechnology, 10, 67-69.
studies in selected orchids. Orchid News, 6-7. Chaudhuri S and Mukundan U (2001). Aloe vera L. – Micropropagation and charaterisation of its gel. Phytomorphology 51 (2)155-157. Chatterjee P, Golwalkar S and Mukundan U (2001). Removal of aromatic amines and phenols from water by peroxidase produced by cell cultures of Momordica dioica. Pollution Research 20 (3): 130-134. Sudhir D and Mukundan U (2001). Biotransformation of food antioxidants by Armoracia rusticana hairy root cultures. Plant Cell Biotechnology and Molecular Biology 2 (3-4): 113-118. Mukundan U, Sivaram L, Golwalkar S, Sudhir D and Shrotri (2002). Catharanthus roseus: Status and future prospects. In: Role of Biotechnology in medicinal and Aromatic plants. Vol. V. Special edition on cancer. Eds. I A Khan and A Khanum. pp 203-212. Ukaaz Publications, India. Mukundan U, Sivaram L, Golwalkar S, Sudhir D and Shrotri M (2002). Antiageing constituents of plant origin and their biotechnological aspects. In: Role of Biotechnology in medicinal and Aromatic plants. Vol. VI. Special edition on diseases. Eds. I A Khan and A Khanum. pp 105-123. Ukaaz Publications, India. Mukundan U, Sharda M, Shrotri M, Golwalkar S and Gavahane R (2002). In vitro studies of some plants used in Ayurvedic system of medicine for Madhumeya (Diabetes) In: Role of Biotechnology in medicinal and Aromatic plants. Vol. VI. Eds. I A Khan and A Khanum. Ukaaz Publications, India. Sivaram L and Mukundan U (2002). Feasibility of commercial micropropagation of Stevia rebaudiana in India. Journal of Tropical Medicinal Plants 3(1), 97- 103. Sudhir D and Mukundan U (2002). In vitro tuberisation of Armoracia rusticana and histochemical localization of peroxidases. Phytomorphology 52 (4), 301-309. Mukundan U, Sivaram L and Kumar A ( 2002). Micropropagation of Tylophora asthmatica and Uraria picta. Plant Cell Biotechnology and Molecular Biology 3 (1-2) 73-76. Sivaram L and Mukundan U (2003) In vitro culture studies on Stevia rebaudiana. In Vitro Plant, Cellular and Development Biology, 39 (5), 520-523. Bhagwat V and Mukundan U (2003). Effect of auxin transport inhibitors on morphology and growth of hairy root cultures of Beta vulgaris. Plant Cell Biotechnology and Molecular Biology, 4 (3-4), 145-150. Mukundan U and Sivaram L (2004). Mass production of orchid seedlings through tissue culture technique. In : Orchids Biodiversity and Conservation- a Tissue Culture Approach, Ed. S J Britto. Institute of Natural Resources, India. Shrotri M, Gavhane R and Mukundan U (2004). In vitro plant regeneration of Centella asiatica (L.) Urban and determination of Asiaticoside using HPTLC. Journal of Tropical Medicinal Plants, 5(1), 89-95. Shrotri M and Mukundan U (2004). Thidiazuron induced rapid multiplication of Rubia cordifolia L.- An important medicinal plant. Phytomorphology, 54(3-4), 201- 207. Shrotri M, Gavhane R and Mukundan U (2005). High Performance Thin Layer Chromatographic Analysis from Rubia cordifolia L. Indian Drugs (IDMA). Vol.42. No.1. 20-23. Anjaria K and Mukundan U (2005). Herbal treatments for diabetes. In: Modern and alternative medicine for diabetes. Eds. I A Khan, A Khanum and A A Khan. pp 194-228. Ukaaz Publications, India. Anuja Deo and Mukundan U (2005). Herbal medicine for human diseases. In: Herbal Medicine for Human Diseases Vol.II. Eds. I A Khan and A Khanum, pp 1-37. Ukaaz Publications, India. Sayed ZN and Mukundan U (2006). A brief overview of medicinal plants of India. In: Role of Biotechnology in medicinal and Aromatic plants. Vol. XIII. Eds. I A Khan and A Khanum. Pp107-164 . Ukaaz Publications, India. Gavahane R, Sharda M, Ratnaparkhi S and Mukundan U ( 2006). Secondary metabolites and medicinal plants. In: Role of Biotechnology in medicinal and Aromatic plants. Vol. XIII, Eds. I A Khan and A Khanum. pp 165-211. Ukaaz Publications, India. Mukundan U (2006): Hairy root cultures. In: Plant Biotechnology perspectives and prospects ed. P C Trivedi. Pointer publishers Jaipur. Sharda Menka and Mukundan U (2006). Somatic embryogenesis- An important tool for in vitro propagation of plants. In: Advances in Biotechnology, Ed. PC Trivedi. Agrobios Publication, India. Gavahane Rahul and Mukundan U (2006). Micropropagation of Acorus calamus and markers identification in plants. Journal of Tropical Medicine, 7(1), 105-109. Sharda M and Mukundan U (2006): Rapid and efficient plant regeneration in Emblica officinalis via Somatic Embryogenesis. Plant Cell Biotechnology and Molecular Biology, 7(3-4), 123-128. Sayed Z N, Deo R and Mukundan U (2007). Herbal remedies used by Warlis of Dahanu to induce lactation in nursing mothers. India Journal of traditional medicine, 6 (4), 606-610. Moses T and Mukundan U (2009). Edible Vaccines. In Biotechnology: Tissue Culture to Proteomics, 232-245, Ed. PC Trivedi, Pointer Publishers, Jaipur (India). Kawlekar S and Mukundan U (2009). Dyeing cotton with Natural Colourant. Textile Trends No.11, February 24, 33-37. Yadav S and Mukundan U (2009). Antioxidants A new era drug. The Botanica, 57, 28-37. Gavahane R and Mukundan U (2010). Somatic embryogenesis in Tinospora codifolia using in vitro leaf explants. Research Journal of Biotechnology, 5(1), 39-43. Yadav S and Mukundan U (2011). Antioxidant activity of Ocimum basilicum and Salvia officinalis. Research Journal of Biotechnology, 6(3), 22-25. Yadav S and Mukundan U (2011). In vitro antioxidant properties of Salvia coccinea Buc’hoz ex etl. and Salvia officinalis L. Indian Journal of Fundamental and Applied Life Sciences, 1(3), 232-238. Ambatkar M and Mukundan U (2012). Enzymatic treatment of wastewater containing dyestuffs using different delivery systems. Scientific Reviews and Chemical Communications, 2(1), 31-40. Patil J, Karangutkar M, Yadav S, Verma M, Moses T and Mukundan U (2012). Micropropagation of some essential oil yielding plants. In: Recent Advance in Medicinal Plants and their Cultivation. Eds. A Kumari, RK Lal and RK Khajuria. Manglam Publications, Delhi (India). Concepts in Biology (XII) (1995) Uttam Prakashan, Bombay (7th edition). Effective Botany for F Y B.Sc (1996) for students of Mumbai University. Botany for S Y B.Sc (1997) for students of Mumbai University, Agro Botanica Publishers, Bikaner. Practical manual for S Y B.Sc Botany (1997) for students of Mumbai University, Agro Botanica Publishers, Bikaner. Hairy root cultures and secondary metabolite production (1997) Studies in Biotechnology Series No.2. Agro Botanica Publishers, Bikaner. Concepts in Biology (XII) (2007) Uttam Prakashan, Mumbai. Usha Mukundan and Martin Hjortso. Thiophene production by hairy root cultures of Tagetes species. March 4 – 6, 1990, Meeting of the Southern section of ASPP, Biloxi, Mississipi, USA. Usha Mukundan and Martin Hjortso. Thiophene production by hairy root cultures of Tagetes patula: Elicitation of thiophene production. VII International Congress on Plant Tissue Culture, Amsterdam, June 24-29, 1990. Usha Mukundan. Large scale production betalains by hairy root cultures of Beta vulgaris. Invited paper at the brain storming session of Department of Biotechnology at CFTRI, Mysore, May 7, 1993. Usha Mukundan, Himanshu G Dawda, Seema Ratnaparkhi and Sanchita Bhattacharya. Hairy root culture – Prospects with reference to India flora. Int. Symp. On recent trends in Life Science, Hyderabad, Nov. 19-22, 1993. Seema Ratnaparkhi, Usha Mukundan and S M Karmarkar. Studies on hairy root cultures of Eclipta alba Hassk. Int. Symp. On recent trends in Life Sciences. Hyderabad, Nov. 19-22, 1993. Himanshu Dawda and Usha Mukundan Preliminary investigation on hairy root cultures of Withania somnifera. Int. Symp. On recent trends in Life Sciences. Hyderabad, Nov. 19-22, 1993 (First prize for best poster). Himanshu Dawda and Usha Mukundan. Production of bryonolic acid by hairy root cultures of Cucumis sativus L. VIII International Congress of plant tissue and cell culture. Florence, Italy June 12-17, 1994. Usha Mukundan. The Production of secondary metabolites from root cultures of some compositae. Invited paper in Compositae Systematics, Biology and Utilization at the International Compositae Conference, Royal Botanic Gardens, Kew, Richmond Surrey, London, July 24 to August 5, 1994. Himanshu Dawda, Usha Mukundan and Aruna Rai. Establishment and studies of hairy root cultures. Recent Advances in Biotechnological applications of plant tissue and cell culture. XVII meeting of PTC association of India. Mysore, June 22-24, 1995. Seema Ratnaparkhi and Usha Mukundan. Growth kinetics and hairy root cultures of Eclipta alba. Recent Advances in Biotechnological applications of plant tissue and cell culture XVII meeting of PTC association of India. Mysore, June 22-24, 1995. Sanchita Chaudhuri, Usha Mukundan and Vaishali Bhide. Encapsulation of axillary buds of Dianthus caryophyllus. Recent Advances in Biotechnological applications of plant tissue and cell culture XVIII meeting of PTC association of India. Mysore, June 22-24, 1995. Usha Mukundan, H Dawda, Seema Ratnaparkhi and Aruna Rai. Establishment of multiple shoot cultures and transformation of Taraxacum officianale L. Plant tissue culture: Commercialisation, Diversification of Agriculture and preservation of fragile ecosystems. XIX PTC association of India, Pantnagar U.P. April 10-12, 1996. Vaishale Bhide and Usha Mukundan. Extraction, separation, analysis of betalains from hairy root cultures of Beta vulgaris L. (Awarded Best Poster). Plant tissue culture: Commercialisation, Diversification of Agriculture and preservation of fragile ecosystems. XIX PTC association of India, Pantnagar U.P. April 10-12, 1996. Usha Mukundan. Secondary metabolite production by hairy root cultures. Invited review lecture at Advances in Plant tissue culture and Biotechnology researches in last ten years. Nov 23-25, 1996. National seminar, Department of Botany, Dungar College, Bikaner. Usha Mukundan. Production of peroxidases from transformed root cultures. Invited lecture at the symposium on Enzymology: Clinical and Industrial aspects. held at Lokmanya Tilak Municipal Medical College, Sion, Mumbai, January 9-11, 1997. Usha Mukundan and Wayne R Curtis. Growth performance of hairy root cultures in bioreactors. Invited lecture at National symposium on Recent Advances in Plant Biochemistry and Plant Physiology, University of Hyderabad, Hyderabad, January 29-31, 1998. Usha Mukundan. In vitro production of fine chemicals by cell suspensions and organ cultures. Ayurveda update ’98. Seth G S Medical College, Mumbai, February 11-14, 1998. Usha Mukundan, Aruna Rai, H Dawda, Seema Ratnaparkhi and Vaishali Bhide. Applications of Agrobacterium mediated transformed root cultures. Invited paper at National Symposium: Commercial aspects of plant tissue culture and Molecular Biology. XXI meeting of the PTCA India, February 25-27, 1998. Usha Mukundan and Wayne R Curtis. Betalain production by hairy root cultures of Beta vulgaris IX IAPTC Congress Jerusalem Israel, June 14-19, 1998. Usha Mukundan. Scaling up studies on Agrobacterium mediated transformed root cultures (Invited Symposia Paper). International conference on Life Sciences in the next Millenium ICRISAT, Hyderabad, December 11-14, 1999. Panelist in panel discussion on Food security. Usha Mukundan Hairy root cultures as an experimental tool. Invited paper at the Botany session of the Indian Science Congress, Pune January 3-7, 2000. Usha Mukundan and Veena Bhagwat. Large scale production of betalains as a natural food colorant from hairy roots of Beta vulgaris L. The Asia Pacific Conference on Plant Tissue Culture and Agribiotechnology, Singapore, 19-23 November, 2000. Usha Mukundan. Transformed root cultures. Invited paper at UGC Sponsored National Seminar on Advances in Biotechnology, Birla College, Kalyan, April 27-29, 2001. Madhura Shrotri and Usha Mukundan. A Simple liquid medium for in vitro multiplication of Bacopa monniera. UGC Sponsored National Seminar on Advances in Biotechnology, Birla College, Kalyan, April 27-29, 2001. Sucheta Golwalkar, Latha S, Krishnakant J and Usha Mukundan. Mass propagation of pineapple. UGC Sponsored National Seminar on Advances in Biotechnology, Birla College, Kalyan, April 27-29, 2001. Usha Mukundan. In vitro propagation of Oncidium hybrid Taka by flower stalk cultures. National seminar on Orchid diversity and Commerce, The Orchid Society of India, Palampur (HP) October 11-14, 2001. Madhura Shrotri and Usha Mukundan. Morphological and physiological changes in Boerhavia diffusa as a result of cytokinins. National seminar of Indian Botanical Society, Hyderabad, November 18-20, 2001. Latha Sivaram and Usha Mukundan. Commercial propagation of Stevia rebaudiana National seminar of Indian Botanical Society, Hyderabad, November 18-20, 2001. Usha Mukundan and Veena Bhagwat. Enhancement of betalain production by hairy root cultures of Beta vulgaris by micronutrient supplement. National seminar of Indian Botanical Society, Hyderabad, November 18-20, 2001. Usha Mukundan. Role of tissue culture in cultivation of medicinal plants. Invited lecture at Herbal World 2002 organized by Prabodhan Goregaon, Mumbai March 1-3, 2002. Rahul Gavahane and Usha Mukundan. Use of HPTLC as a tool for standardization of herbal products (Poster Presentation) Herbal world 2002 organized by Prabodhan Goregaon, Mumbai March 1-3, 2002. Deepa Sudhir and Usha Mukundan. Micropropagation of Armoracia rusticana (Poster presentation) Herbal world 2002 organized by Prabodhan Goregaon, Mumbai March 1-3, 2002. Madhura Shrotri and Usha Mukundan. Micropropagation of Hemidesmus indicus (Poster presentation) Herbal world 2002 organized by Prabodhan Goregaon, Mumbai March 1-3, 2002. Usha Mukundan Waste water treatment using plant peroxidases. Invited paper at Environment Seminar, Jai Hind College, 15-16 February, 2003. Madhura Shrotri and Usha Mukundan. Optimisation of betalain production by hairy root cultures of Beta vulgaris and scaling up studies, Jaipur, Feb. 17-19, 2003. Sucheta Golwalkar, Khyati Anjari and Usha Mukundan. Micropropagation of an elite variety of Annanas comosus L. Jaipur, Feb. 17-19,2003. Menka Sharda and Usha Mukundan. Micropropagation and hairy root induction of Hemidesmus indicus. Jaipur, Feb. 17-19, 2003. Latha Sivaram, Menka Sharda and Usha Mukundan. Micropropagation of Stevia and studies on stevioside production by in vitro cultures. National Seminar on the role of Biotechnology in the development of Indian Economy, Held at V G Vaze College, Mumbai, 22-23 February, 2003. Madhura Shrotri, Deepa Sudhir, Nudrat Sayed and Usha Mukundan. Transformation of Armoracia rusticana and production of peroxidases by hairy root cultures. National Seminar on the role of Biotechnology in the development of Indian Economy, Held at V G Vaze College, Mumbai, 22-23 February, 2003. Sucheta Golwalkar, Rahul Gavahane, Khyati Anjaria and Usha Mukundan. Production of Bryonolic acid by callus and transformed roots of Momordica dioica. National Seminar on the role of Biotechnology in the development of Indian Economy, Held at V G Vaze College, Mumbai, 22-23 February, 2003. Usha Mukundan. Studies on Aloe vera L. and Withania somnifera Dunal. Invited symposia lecture in the 91st Indian Science congress held at Chandigarh, 3-7 January, 2004. Madhura Shrotri, Rahul Gavahne Khyati Anjaria and Usha Mukundan. In vitro propagation of Centella asiatica and identification of marker constituent Poster presentation at the 91st Indian Science congress held at Chandigarh, 3-7 January, 2004. Menka Sharda, Madhura Shrotri and Usha Mukundan. Standardisation of protocol for efficient DNA extraction from various parts of Mangifera indica (Poster Presentation) at the 91st Indian Science congress held at Chandigarh, 3-7 January, 2004. Nudrat Sayed and Usha Mukundan. Germination studies on Terminalia arjuna L. (Poster Presentation). 91st Indian Science congress held at Chandigarh, 3-7 January, 2004. Usha Mukundan. Six Sigma as a measurement tool of quality. Invited lecture at the two day NAAC sponsored workshop on New Initiativities after 25 years of autonomy held at PSG College, Coimbatore, 17-18 March, 2004. Usha Mukundan. Best Practices in our Institution: Research, Consultancy and Extension. Invited lecture at the NAAC sponsored Workshop on Best practices held at Birla College, Kalyan, 2-3 January, 2004. Usha Mukundan. By passing the plant for secondary metabolite production. Invited lecture at the National Seminar on Biotechnology and Bioinformatics Challenges and prospects held at Rai University, Navi Mumbai 28 March, 2004. Usha Mukundan. Six Sigma as a measurement tool of quality. Invited lecture at the two day NAAC sponsored National conference on Post Accreditation Initiativities: Best Practices in Higher Education held at K J Somaiya College, Vidyavihar, 24-25 September, 2004. Usha Mukundan. Edible vaccines. Lead lecture at the UGC sponsored National conference on Human Health and Nutrition: A Biotechnological Approach held at B N Bandodkar College, Thane on 12-13 December, 2004. Usha Mukundan. Total Quality Management and GATTS. Key speaker at the State Level Seminar on Post Accreditation and Quality sustenance held at KMC College, Khopoli on 10 January, 2005. Veena Bhagwat and Usha Mukundan. Improvement of betalain production by hairy root cultures of Beta vulgaris L. by methyl jasmonate (Poster Presentation). Life Science symposium organized by BARC, Trombay, Mumbai from 19-21 December, 2005. Sucheta Golwalkar and Usha Mukundan. Genetic engineering of Populus deltoides to Improved performance over abiotic stress. Poster Presentation at the Life Science symposium organized by BARC, Trombay, Mumbai, 19-21 December, 2005. Anuja Deo, Mamta Verma and Usha Mukundan. Marker constituent- a tool for identifying the presence of a drug in marketed samples (Poster Presentation). National Conference on Medicinal Botany, September 7-8, 2007 organized by Chikitsak Samuha’s Patkar College, Mumbai. Manasi Karangutkar, Sadhana Yadav and Usha Mukundan. Ocimum basilicum– a potent antioxidant (Poster presentation). National Conference on Medicinal Botany, September 7-8, 2007 organized by Chikitsak Samuha’s Patkar College, Mumbai. Anuja Deo and Usha Mukundan. Marker profiling of two hepatoprotective plants used in the Indian system of medicine (Poster Presentation). National Conference on New Horizons in Biotechnology, February 8-9, 2008 organized by Department of Biotechnology, Swami Vivekanand Mahavidyalya, Latur. Manasi Karangutkar and Usha Mukundan. In vitro mass propagation of an important medicinal herb: Ocimum gratissimum (Poster Presentation). National Conference on New Horizons in Biotechnology, February 8-9, 2008 organized by Department of Biotechnology, Swami Vivekanand Mahavidyalya, Latur. Usha Mukundan and Sucheta Golwalkar. Secondary metabolite production and enhancement by hairy root cultures (Poster Presentation). National Conference on New Horizons in Biotechnology, February 8-9, 2008 organized by Department of Biotechnology, Swami Vivekanand Mahavidyalya, Latur. Mamta Verma and Usha Mukundan. In vitro Propagation of Antibacterial plant- Matricaria recutita (L.) (Poster presentation). National Conference on New Horizons in Biotechnology, February 8-9, 2008 organized by Department of Biotechnology, Swami Vivekanand Mahavidyalya, Latur. Usha Mukundan. (Awarded Merit of Excellence Award for Best Paper Presentation) Biotechnological methods for cultivation, propagation and raw material production of medicinal plants (Oral presentation). International Seminar on Medicinal plants and Herbal products, March 7-9, 2008 organized by Department of Botany, S. V. University and A. P. Medicinal and Aromatic Plants Board, Hyderabad. Karangutkar M and Usha Mukundan. Phenological comparison between Ocimum basilicum and Ocimum gratissimum (Poster presentation). National Conference on Herbal and Traditional Medicine, February 6-7, 2009 organized by Department of Botany, Dapoli Urban Bank Senior Science College, Dapoli. Usha Mukundan. Herbal remedies used by Warlis of Dahanu to induce lactation in nursing mothers- biotechnological method for conserving an endangered plant with galactogogue properties. Lead Lecture at National Conference on Herbal and Traditional Medicine, February 6-7, 2009 organized by Department of Botany, Dapoli Urban Bank Senior Science College, Dapoli. Mamta Verma and Usha Mukundan. In vitro Propagation of Antibacterial plant – Matricaria recutita (L.) (Poster presentation). National conference on herbal and traditional medicine, February 6-7, 2009 organized by Department of Botany, Dapoli Urban Bank Senior Science College, Dapoli. Sadhana Yadav and Usha Mukundan. Antioxidant potential of Salvia coccinea (Poster presentation). National Conference on Herbal and Traditional Medicine, February 6-7, 2009 organized by Department of Botany, Dapoli Urban Bank Senior Science College, Dapoli. Mugdha Ambatkar and Usha Mukundan. In vitro studies on Armoracia rusticana P. Gaertn., B. Mey. & Scherb. XXXIII Conference of Indian Botanical Society and International Symposium on the New Horizons of Botany on 10-12 November 2010 organized by Shivaji University, Kolhapur. Jayesh Patil and Usha Mukundan. Study of total antioxidant activity of Guaiacum officinale L. (Poster presentation). XXXIII Conference of Indian Botanical Society and International Symposium on the New Horizons of Botany on 10-12 November 2010 organized by Shivaji University, Kolhapur. Mamta Verma and Usha Mukundan. In vitro propagation and antibacterial activity of Kaempferia galanga L. against Propionibacterium acne(Poster presentation). XXXIII Conference of Indian Botanical Society and International Symposium on the New Horizons of Botany on 10 – 12 November 2010 organized by Shivaji University, Kolhapur. Sadhana Yadav and Usha Mukundan. Free Radical Scavenging Activity of Topical Cream Formulation of Salvia coccinea Buc’hoz ex etl. (Poster Presentation). XXXIII Conference of Indian Botanical Society and International Symposium on the New Horizons of Botany, 10-12 November 2010 organized by Shivaji University, Kolhapur. Mugdha Ambatkar, Deepa Sudhir and Usha Mukundan Peroxidase production by microtubers by Armoracia rusticana (Poster Presentation).National Symposium on Impact of Plant Tissue Culture on Advances in Plant Biology and 33rd PTCA(I) Annual Meet, 19-21 January 2012 organized by the Loyola Centre for Research, St. Xavier’s College, Ahmedabad (Gujarat). Tania Moses and Usha Mukundan On-line monitoring of biomass in a balloon type bubble column bioreactor (Poster Presentation). National Symposium on Impact of Plant Tissue Culture on Advances in Plant Biology and 33rd PTCA(I) Annual Meet, 19-21 January 2012 organized by the Loyola Centre for Research, St. Xavier’s College, Ahmedabad (Gujarat). Jayesh Patil, Mamta Verma and Usha Mukundan Rapid in vitro multiplication protocols for Melaleuca alternifolia (Maiden and Betche) Cheel – an important medicinal plant (Poster Presentation). National Symposium on Impact of Plant Tissue Culture on Advances in Plant Biology and 33rd PTCA(I) Annual Meet, 19-21 January 2012 organized by the Loyola Centre for Research, St. Xavier’s College, Ahmedabad (Gujarat). Sadhana Yadav and Usha Mukundan Anti-oxidant activity of Ocimum basilicum and Salvia officinalis (Poster Presentation). National Symposium on Impact of Plant Tissue Culture on Advances in Plant Biology and 33rd PTCA(I) Annual Meet, 19-21 January 2012 organized by the Loyola Centre for Research, St. Xavier’s College, Ahmedabad (Gujarat).